Mary Lee Kortes | Feel the Music! 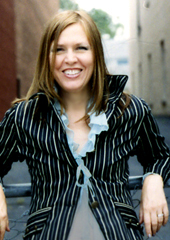 Mary Lee Kortes is an internationally acclaimed singer/songwriter who’s written for an impressive array of recording artists and whose own CD’s have earned 4 stars in Rolling Stone, The New York Times, Billboard, Mojo and The New York Times. She’s also sung backing vocals for artists as diverse as Billy Joel and Placido Domingo. Her songs have appeared in film and television as well as TV commercials. She’s toured the world, including opening slots for Bob Dylan and Joe Jackson. In her songwriting workshops, Mary Lee combines her love of songwriting with her love for working with young people in the process of discovering themselves. As President of the United Nations Singers, she has initiated a program of events with the choir to advance Millennium Development Goal 2, access to primary education for all children worldwide.